Continuing our series on brownfield developments, we look at continuing site investigation past desktop studies and utility mapping to the techniques used specifically for brownfield reconnaissance and targeted non-intrusive investigation. Conducting a brownfield reconnaissance survey is a cost effective method to further enhance and develop the profile of a site, prior to development. We have discussed the advantages of a topographical survey of a brownfield site in previous blogs. 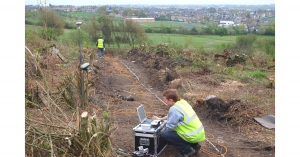 As well as this land based survey, a geophysical survey using electromagnetic conductivity and magnetic techniques can also be conducted, to map the physical and chemical properties of the ground. Geophysical techniques allow rapid data collection, meaning that whole sites can be characterised in a matter of hours or days. The data obtained in a survey may not be completely conclusive but it will provide a basic level of information. This information will enable geophysicists and engineers to interpret the underlying nature of the ground, and identify the areas requiring further investigation. These in-depth geophysical investigations will provide a clearer understanding of where intrusive investigation and monitoring or mitigation is needed. Next week we’ll look at intrusive investigation and monitoring and remediation.